Documentation Photo by Alan Warren. Video by Nicola. exist@metro: Friday Night July 2014 Alrey Batol from EXIST ARI on Vimeo. Alrey Batol will be presenting an interactive installation, Touch Machine. 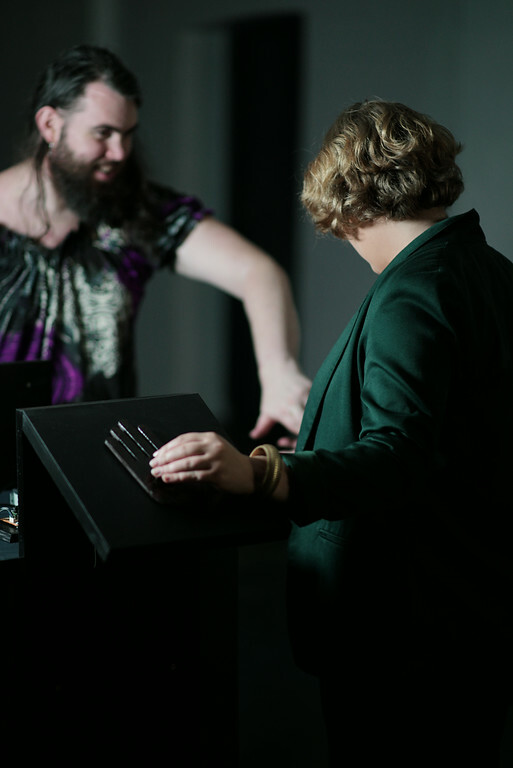 Touch Machine questions the value of touch and the physical body in our own art community, how ready are we to touch and what do we expect will happen? These questions are framed in Batol’s signature use of hacking technology. In this case, it is a hacked radio, which provides the sonic response to how two people approach (ie. testing the sensitivity and frequency of) touching each other. ‘Touch Machine’ shows how Batol’s live art process has developed since his last work in progress, ‘Waterbirds’ was shown at Metro Arts’ Friday Night: May 2013. Inspired by the live art and ready-to-interact audience that fill Metro Art’s Friday Night, Touch Machine further tests the viewers’ interactivity with machines and each other.